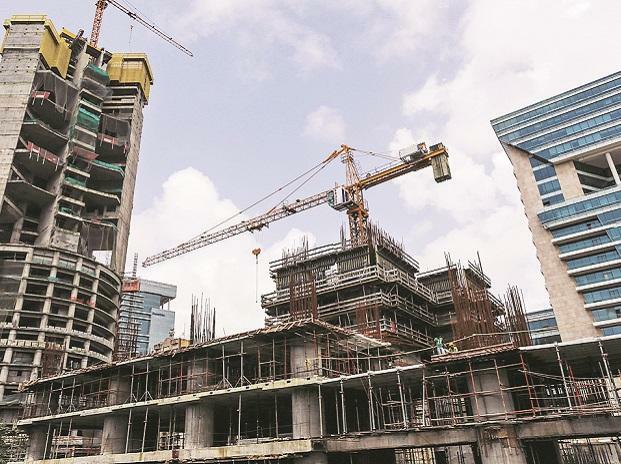 Browbeaten by various factors, including demonetisation, consumer-centric initiatives like Real Estate (Regulation and Development) Act, goods and services tax, Insolvency and Bankruptcy Code, and Benami property law over the past four years, the battle-fatigued real estate sector is finding relief in the high-stakes commercial real estate game. According to industry leaders such as Niranjan Hiranandani, co-founder and managing director (MD) of Hiranandani Group, the need for commercial space was always there, but most players missed the opportunity to develop Grade A spaces for global firms. “In a manner of speaking, we saw it well in time and effectively lead the market. A few years back, industry pundits, especially global consultants, were only talking about residential real estate as the only profitable option. The trend of corporates consolidating across different locations to a single place and expanding workspaces was something we tapped into much earlier. When dearth of good commercial spaces became noticeable, we managed to score high,” he said. Beginning with the largest commercial deal with Brookfield, IT deal with Tata Consultancy Services, an additional 1 million sq ft under construction at Thane, Powai, Panvel, and Navi Mumbai, the Hiranandani Group has developed nearly 5 million sq ft in the past three years, compared to corresponding development over the past 14 years. The company plans to increase its commercial real estate development to almost 50 per cent of the total construction being done. “New segments are coming up in commercial real estate such as co-working spaces, organised retail, and integrated townships with light industrial and logistics. We believe the ratio of residential and commercial in the near future should be 50:50, give or take 5 per cent variation,” added Hiranandani. According to industry experts, in the case of outright sale of commercial properties, the top line of the developer immediately goes up. It is the reverse in the case of the lease model. Here, the builder’s bottom line is better because of a steady rise in rental income over the years. Also, the fact that they can now easily exit via real estate investment trusts is a major draw for a few builders. Hence, the supply is expected to gain significant momentum in 2019 as well. Commercial segment has become a major attraction for private equity (PE) players who have been pumping in funds into this segment over the past few years. According to the Anarock data, commercial segment saw a total PE inflow of nearly $2.8 billion in 2018, up from $2.20 billion in 2017. “In fact, if we analyse PE trends over the past few years, commercial segment saw total PE inflows of nearly $7.4 billion between 2015 and 2018, against just $2.9 billion in residential during the same period. This clearly reflects the interests of PE players — both global and domestic,” said Anuj Puri, chairman, Anarock Property Consultants. According to Ashish R Puravankara, MD, Puravankara, lease rentals in India have been on an upward trend. Rent realisation has broadly been increasing at the rate of 8-10 per cent over the past four years. “We are currently assessing around nine projects in commercial real estate space, which have a development potential in excess of 10 million sq. ft and promise to be strong ones in the segment. 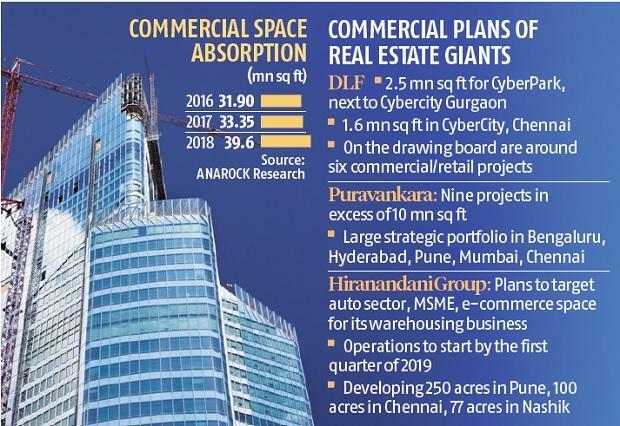 We are looking at building a strong commercial real estate business with a large strategic portfolio covering major cities of Bengaluru, Hyderabad, Pune, Mumbai, and Chennai,” he said. Puravankara added that cash flows are key in real estate. Commercial provides a more predictable and steady cash flow performance, which provides cushion to the overall business. According to the country’s largest real estate firm, DLF, commercial spaces give higher return on investment (RoI), compared to residential spaces. RoI is an aggregation of rental yields as well as capital appreciation. However, Sriram Khattar, MD, DLF Rental Business, said the firm has an equal focus on both residential and commercial business. “Further, our product and price mix in residential and commercial segment across geographies helps us mitigate risks to a large extent. Even though the economy and the segment-specific demand-supply dynamics play a critical role in determining the way forward, we are committed to staying on this course,” said Khattar.